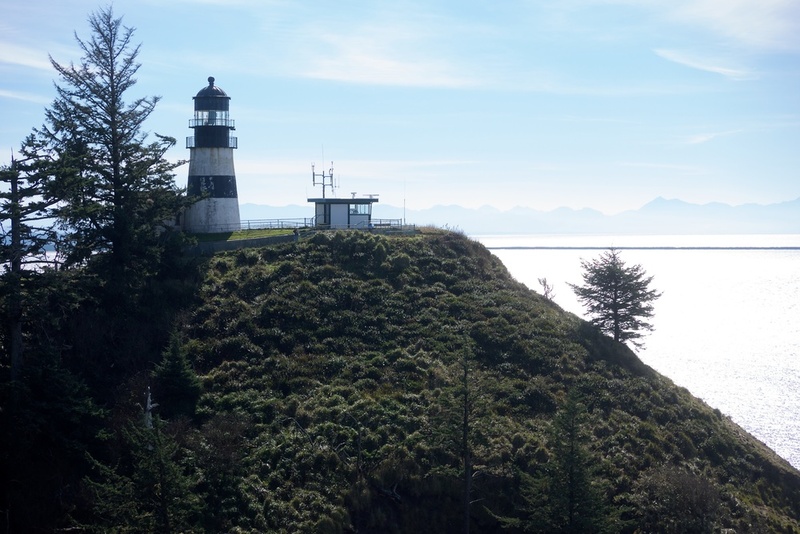 Having spent our last night in Kelso, we decided to swing through Cape Disappointment State Park again to see some of the things we missed the first time through, after which we went home. Unlike the previous morning, there were a lot of teens in the breakfast area. We didn't have problems finding a table, fortunately. I walked by one guy who was having chocolate cream pie for breakfast. I thought to myself that it looked like a good choice. We packed up and checked out, and while we were putting the last things into the car, the kids were piling into their bus. We made a quick exit. It was pretty foggy as we headed out, and by the time we got to the Lewis and Clark Bridge, we couldn't see its top, let alone across the river. As we continued on US 30, the fog continued to get thicker, to the point where we could only see a few car-lengths ahead. We went over one rise, and suddenly everything cleared up and we were looking at blue sky with a scattering of clouds. Eventually we made it back to Washington and to Cape Disappointment, and headed directly towards the Lewis & Clark Interpretive Center. On the way, there was a worker using a leaf blower on the road, which seems kind of strange for a large state park. Guess he was just clearing near the parking lot. There weren't a lot of cars around as we parked, and the interpretive center was likewise somewhat empty as we got there. We wandered through the exhibits showing the timeline of Lewis and Clark's journey, then went upstairs where, among other things, they had the lens that was originally going to be used at the Cape Disappointment lighthouse, but since the lens was too large, it eventually was put into the North Head lighthouse. Part of the lens was cut out so you could see its insides. We went out to look at the remains Fort Cambry, which lie underneath the interpretive center. Walking around the center, we took more looks at the jetties at the mouth of the Columbia, then hit the trail to the lighthouse. The trail to Cape Disappointment lighthouse starts out innocently enough, but we were curious that it kept going down. It curves around Dead Man's Cove, then joins up to the road that connects the Coast Guard station and the lighthouse, so the walk up the road is rather steep. 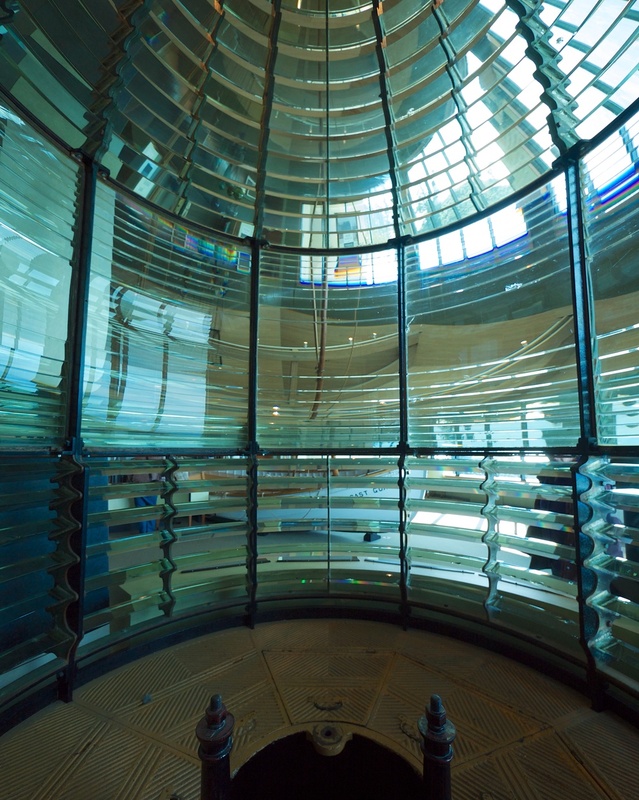 The lighthouse itself is not open for visitors, but you can walk around it, as well as chat with the Coast Guard officer on duty. We found our way back to the car, and being hungry, set about finding lunch. Melody remembered seeing a pizza place in the park, so we found some reviews of it that said it was pretty good. However, we saw that it was closed as we drove by. Remembering some friends recommended another place nearby, we found directions to it and had a great meal. It was time to head back home, and we knew we would hit traffic as we got to Tacoma, but since we weren't in a rush we didn't worry about the timing. The early part of the drive was very pretty, going along the Willapa Bay and the Willapa National Wildlife Refuge, as well as the sloughs by the Chehalis River. While we weren't in a rush, we were ready to get home; we'll have to go back and spend some time around the area.